Gado Gado! The platter dish. The dish as finger food, or appetizer or starter (Rice Vadai, Chinese Prawn Fritters, Grilled Chicken Wings, Fried Shrimp Wantons & Bonda). Actually Gado Gado can even be your main course. Perhaps? If you don't want a heavy meal or a complete Gado Gado like this one, trust me, can fill you up as well. What can expect in Gado Gado? Tofu, potatoes, tempeh/fermented soy and fresh raw vegetables. My this, Nava K's version is a vegetarian and grilled version instead of frying the items. Of course, you can, go ahead, include fried seafood, poultry, meat or whatever whichever. Blend/ground galangal, lemongrass, dried chillies, shallots and shrimp paste for a thick-smooth paste. Heat 4 tbsp of oil and when heated, add the paste. Fry until aromatic and oil splits. .
Pour in tamarind juice, add cashew nuts, sugar and salt. As for the other ingredients; grill (I grilled over the the portable grill) eggs, potatoes, tempeh and taufu on both sides. Then slice into bite sizes. Arrange all of them with the cucumber and salad leaves on a plate and serve with the dipping sauce. 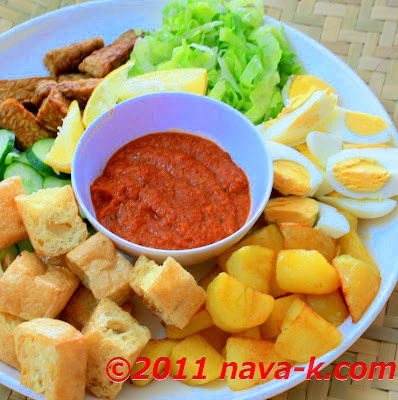 I love gado gado! Thanks for sharing your version...makes me feel like being in SE Asia! Looks great. I could eat this for dinner. Yum! looks like what we call pica-pica in philippines. Nava - this is a great party/dipping dish. Thanks for sharing! Nice shot! 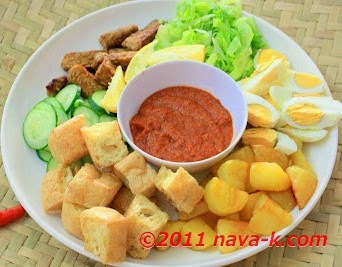 My mom loves gado gado & this looks so yummy! thank you so much for all the wonderful sharing and comments everyone, appreciate it sincerely. 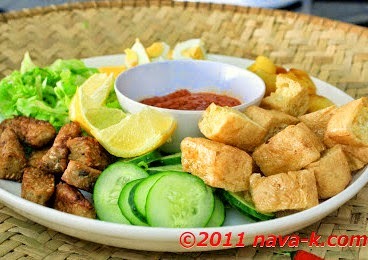 Great idea for the sauce,I never use cashew nut for gado-gado,,,,and these tofu looks perfectly cook. You are right and no need to assume. It's from Jakarta, Indonesia. Looks yum, you have made it perfectly.